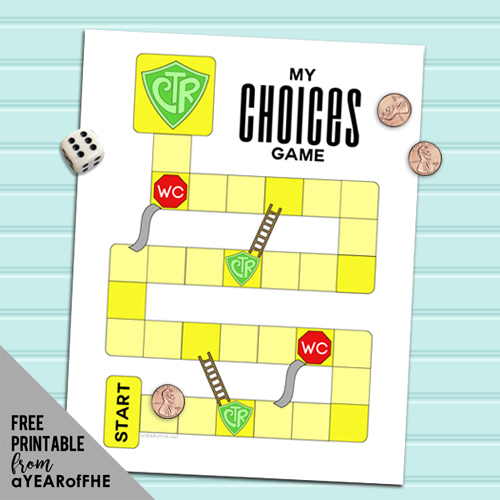 Today I am sharing a printable game that is included in my Our Chocies and Consequences Family Home Evening. This is set up like a very simple version of the popular children's board game, Chutes and Ladders. It can be used for a Sabbath Day activity, a time when your kids need a refresher about consequences, or for the activity of any Family Night. - Print the game onto a sheet of card stock. - Have children color the game. - Use buttons, pennies or marshmallows as game pieces and a dice to play the game.